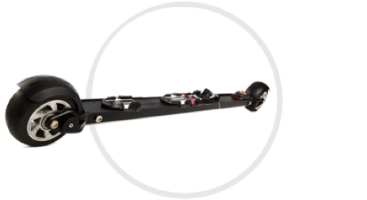 The award-winning rollerskis from Rollersafe have integrated electronic brakes. With the safe and comfortable brake you can easily control speed in any situation. Go anywhere, steeper, faster, but safer. What is Rollersafe, and how does rollerskis with wireless brakes works? RollerSafe has developed the world’s first roller ski with electronic brakes. The award-winning RS Smart Brake Technology provides an easy and safe speed reduction in any track condition and user situation. RS Remote for wireless control of the brakes, through radio frequency. The brake trigger has 80 points in 30 degrees resolution, ensuring a “seamless” brake force adjustment. The remote is mounted on the ski pole, with an easy slide-on/off function. See available pole models. Hydraulic pump controlling disc brake pads through calipers on the rear wheel; similar solution you find on most bikes. The pump is powered by a rechargeable battery (USB), ensuring 50+ hours of use fully charged. The brake force can be customized to the users’ preferences (weight, race profile, etc) through the RS Safety App. This enables users of different weight to use the same ski, and get equally soft brake. RollerSafe makes no compromise on safety and design. The technology is based on dual brake system, separate for left and right ski and pole (redundancy principle). The technology has been tested extensively during 6 years, both in custom-built test rigs, and outdoor in all weather conditions. The electronics are protected with sealed covers, enabling for use in rain, salty conditions and rough terrain. 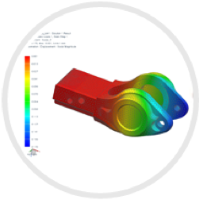 All components have been thoroughly selected and tested for material tolerance. We put much emphasis on functional design, such as unique slide-on binding features, click-on mud-guards, etc. 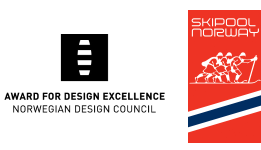 RollerSafe has received several design awards for our state-of-the-art products. How is the quality compared to other brands? RollerSafe has participated in several side-by-side roller ski tests during the last 2 years, including Europe’s most extensive roller ski test. Our products get high ranking on key roller ski features such as balance, stability, rolling resistance, flex, etc. E.g. testers often score our skis on par or better compared to market leading training models from Swenor, Swix, etc. Our brake technology are perceived as revolutionary and easy to use by the same testers. What does other customer think about Rollersafe? We have several hundred customers around the world using our products daily in all sorts of conditions. See what they say about us. RollerSafe is invented in Norway, by a small team of experienced industrial designers, mechanical engineers and software developers. They all share the same passion for sports and high quality products. Meet them. Our products are assembled, tested and shipped from RollerSafe headquarter in Son outside Oslo in Norway. Our test facilities and workshop are among the most advanced within the sports of roller skiing. How does the 30 days open purchase work? Test RollerSafe at home and get familiar with our unique technology. RollerSafe offer all customers full refund of product cost within 30 days from order date. Refund does not include return shipment cost. What is your shipping time and method? RollerSafe use world’s largest logistic provider DHL as our shipping partner, to ensure the fastest and most convenient shipment of your RollerSafe products. We ship door-to-door, and provide all customers with their own tracking code enabling live status of your order. Normally, most shipments take from 1-5 business days. Our products are ready for shipment within 7 business day from registrered payment on orders. Our product prices are subject to local taxes (VAT and other tarifs) in the customers’ respective home country. The taxes will be payable upon arrival of the product at the destination. Will RS Remote fit with my ski pole? RS Remote is adaptable with most Swix pole models, and a selective range from OneWay. For other pole models with a diameter of 16mm, we recommend to buy a pair of Swix pole shafts. 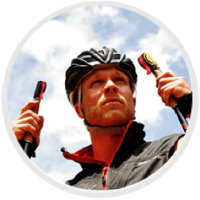 In our webshop you can also buy complete Swix poles. How safe are the brakes? RollerSafe makes no compromise on safety. The dual brake system ensures backup in case of power shortage on one ski/trigger. The RS Smart Brake Technology has been tested extensively in our test facilities and on the road since 2010. What are the temperature and inclination limits? RollerSafe has passed the test of challenging Norwegian climate and conditions. Our technology has been tested and used in extreme conditions, such as downhill (15%), heat (>40 celcius), water, salt, grawel, etc. If you have questions to specific conditions, please contact us. Will I get warranty on my rollerskis? All our products have 2 years warranty. Read about warranties and disclaimer. Can I get service and repair? Normal tear&wear should be expected on wheels and brake pads. You can easily replace these parts yourself. I have received the rollerskis. How do I get started? Charge the skis before first use. Est. 7 hours for full battery capacity. The battery is also drained in OFF-modus. CHARGE YOUR SKIS BEFORE EVERY TRIP. Battery indicator in the current version of RS Safety App is for illustration only. If in doubt about battery status, do not start using the brakes before charging. Get familiar with the brake system; start slow and with lower brake force. 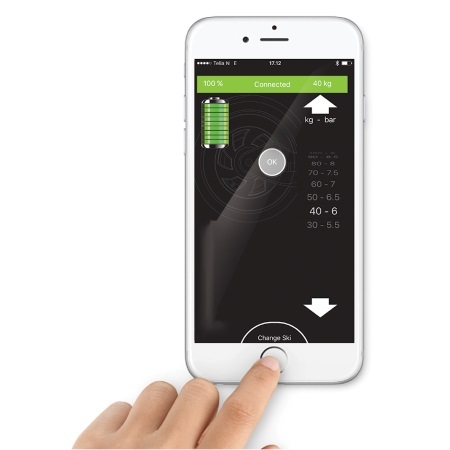 Adjust force via RS Safety App, download at rollersafe.no (IOS/Android). If you experience problems adjusting the brake force with the app, contact us for support. Be aware that brakes will get softer after a couple of trips. Always check your brakes before starting a new trip and before entering downhill. Read the User Manual carefully. Questions about setup, use or maintenance? Do not hesitate to contact us. With the App, you can easy adjust the brake force to your needs. Make sure the skis are FULLY CHARGED before connecting the app. CHARGE THE SKIS BEFORE EVERY TRIP. The battery indicator in app is for ILLUSTRATION ONLY. your app should now work. NOTE! This is a beta version. Please contact us if you experience any bugs or failure during use of the App. How do I adjust the brake force? When skis are connected to USB-charger, open the app and search for ski. Connection is marked with constant green light in ski. Now you can adjust brake force, by using the scale (kg/bar) in the app. We strongly recommend that your first test the brakes on flat terrain with a low brake force (e.g. 40 kg), to get familiar with braking and balancing your body during use. At first your brakes will feel sharp, after the some usage the brakes will feel smooth. During normal use, the required brake force highly depend on your race profile and weight, so we advise that you test different brake force levels during the first period. User tips: Set different brake force on each ski, enabling for a soft brake to be used in flatter terrain, and a stronger brake for steeper tracks. First try to uninstall your app on the phone or tablet and re-install the app. Ski: With 100% battery capacity (7 hours charging), you have est. 50 hours of active use, or est. 7 days stand-by time. With 1-3 training sessions during a week, you would need to charge the skis each week. To be sure you always have sufficient battery, we recommend that you charge the skis before each trip. Remote: The RS Remote use CR2032 batteries, with an expected life time of 1 year. Make sure the remotes are stored without the trigger activated, as activation drain the battery. Try to change the charger cable and see if this helps. Try to use another micro USB charger to make sure that its not the charger that’s the problem. Please contact us if you still are not able to charge your skis. Make sure that the skis are fully charged and that your charger works properly. Fully charged ski will give you a constant green light around the micro USB port. Push on/off button for at least 3 sec. If your skis still will not turn on, please contact us. Can the signal be interfered? The technology use components with CE-cerification to ensure no interference with other power sources or transmitters. The RS Remote can only communicate with one ski at a time (based on active sync). Make sure that your grip controllers have powered batteries. Make sure your skis are turned on and that you push in the on/off button and the trigger when you try to sync. A red light will appear around the on/off button on the skis. How do I adjust the binding? Can I use other shoes than NNN? At the moment, RollerSafe is only available with the NNN-system. How do I best clean the skis? We recommend to use a cloth and mild soap to clean the skis. Do not use high preasure water, as this will damage the skis and harm the wheel bearings and create leakage in the control box. New wheels and brake pads need some time of use before you get a smooth and even brake. It takes approximately 20 brake manoeuvres to tear off the top layer on brake pads and wheel rims, similar to bike brakes.